Sip/Puff solutions are ideal for people who have limited or no motor capability to operate switch activated devices, including computers, augmentative communication devices, adapted toys, environmental control systems and devices accessed or controlled by scanning. Sip/Puff technology is also popular for wheel chair navigation. Use the second generation Breeze to access iPad, iPhone and the iPod touch with Apple's Switch Control feature. 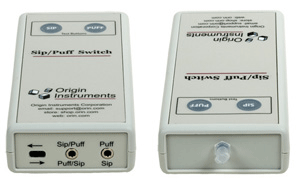 There are several ways to configure a sip and puff switch solution. The first consideration is the user interface. 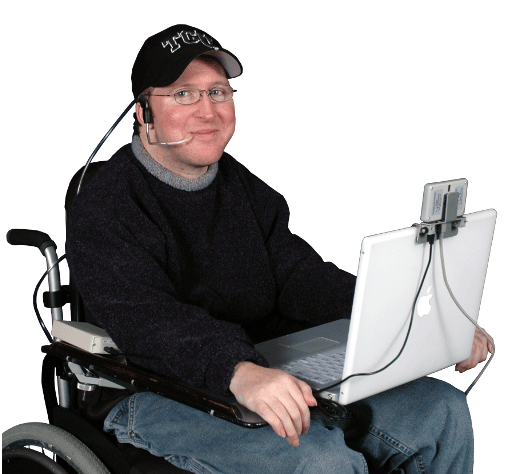 We provide two styles of headsets, single-user and multi-user, and a gooseneck user interface. The multi-user headset features a totally detachable mouthpiece assembly that is easily replaced for situations where multiple people will be using the same Sip/Puff Switch. For situations where a headset is not desired, a flexible gooseneck style interface is available. The gooseneck user interface features twist-on filtered mouthpieces. The second consideration is connectivity. The device that turns the sips and puffs into electrical signals (often referred to as a "switch interface") for a computer or AAC device is available in two forms. If a simple switch closure over a standard 3.5-mm connector is desired then the passive Sip/Puff Switch is the proper choice. If a USB output is desired then Sip/Puff Breeze is the proper choice. Second generation of Breeze builds on the original's comprehensive sip and puff switch, and computer interface solution by adding the capability to generate Apple iOS Switch Control events. It is a first class Sip/Puff sensor with and integrated USB computer interface. Using Breeze's DIP switch tell it what events your application needs, plug it in, attach a pneumatic tube, and your application is ready for access. Breeze - Breeze is an advanced USB sip/puff switch in an extremely compact package. It connects directly to standard USB ports on computers, laptops and AAC devices and provides hardware emulation of mouse buttons or joystick functions. For special applications, sensitivity is selectable and dynamic pressure readings can be directly accessed through the USB interface. The integrated pneumatic port connects directly to a range of available user interface options including Headset and Gooseneck. The Origin Instruments Sip/Puff Switch is the leading sip-puff system for individuals with motor disabilities and limited dexterity. This multi-user version of the popular Sip/Puff Switch provides healthcare institutions, assessment centers, hospitals, etc. with a means to support multiple users while eliminating concerns over sanitation. The padded, head-referenced design affords comfort and convenience. The disposable mouthpiece includes an in-line aseptic filter to enable hygienic, worry-free access by a succession of users. The system is packaged in a compact case for easy storage and transport. Each disposable mouthpiece is enclosed in a sealed package that includes a pair of latex-free gloves and an instruction sheet. The mouthpiece filter eliminates sanitary concerns on behalf of both the user and the attendant while retaining sip-puff convenience, accuracy and reliability. The disposable mouthpiece attaches in seconds using a snap-fit fastener to the padded headset. After usage, the mouthpiece is discarded and replaced so the systm is immediately available for the next user. The mouthpiece is connected by plastic, latex-free tubing to a switchbox that converts sips and puffs into electrical signals. The switchbox connects to the computer or interface device through a single cable. The kit's instrument case stores all components in a compact package. The case is similar to a small briefcase, complete with handle and snap closures. This packaging is ideal for storage and transportation within a busy and large health care institution.